It’s no secret that the Hispanic audience, in particular the Mexican audience, is the backbone of boxing in the United States. One only need look at the monster PPV numbers it does on Cinco de Mayo and Mexican Independence Day in September, when not even the UFC would dare try and compete. The reputation of Mexican fighters is based on the size of their hearts, not their bodies. Images of Julio Cesar Chavez walking fearlessly through the bombs of Edwin Rosario, Salvador Sanchez taking apart Wilfredo Gomez and Juan Manuel Marquez’ jaw hanging open as though it had been unhinged by Manny Pacquiao’s punches in their first fight and somehow fighting through it, are just a few of many examples of what we’ve come to expect from the Mexican pugilist. But in America, a country obsessed with size, fighters that compete in the smaller weight classes have never been held in the same regard as those in the heavier weight divisions. In short (no pun intended) they are too small to be larger – than – life (sorry, had to do it).For many, it’s hard to be in awe of an athlete that weighs about the same as your typical high school girls volleyball player. Americans want something that is beyond them, something that brings out a sense of intimidation, in boxing, that means heavyweights. A Mexican heavyweight has always been one of the sport’s biggest curiosities. The combination of built – infan base and glamour division privilege is a natural. Thus far, there have only been a handful of Mexican or Mexican – American heavies, each having found various degrees of success. Manuel Ramos from Hermosillo, Sonora Mexico had a good run from 1966 – 68 during which he beat proven contenders, Eddie Machen and Ernie Terrell. This eventually led to a shot at NYSAC heavyweight champion, Joe Frazier. Ramos fought well in the opening round, even wobbling Frazier with a right hand but like most of “Smokin” Joe’s opponents, succumbing to a barrage of those legendary left hooks that ended his dream a round later. It would be more than two decades later before another notable Mexican big man came along. Alex Garcia came from the San Fernando Valley, taking up boxing after spending five years in San Quentin for assault with a deadly weapon. At one point, Garcia was 32- 1 (26) and on the verge of securing a date with George Foreman whom he had turned down three years earlier despite an offer of 750,000 dollars. Oops. Journeyman Mike Dixon, a supposed tune up, turned the lights out on the Californian with a left hook to the temple and forever removed Garcia from title contention. It would be yet another fifteen years until Chris Arreola showed up. Arreola, from Riverside, California is still an active heavyweight but not the same fighter that he was when he was nearing his failed title shot against VitaliKlitschko. Now let’s be honest, “The Nightmare” as he is called, never had the look of a professional fighter and for good reason: he lacked the discipline to put himself through the grinder in training and his eating habits may have been even more wishy – washy. His style came from something back in our evolutionary chain, ponderous, clubbing blows delivered with the grace of a drunken sailor on furlough. But in all fairness there was a point in his career when Chris was a serious prospect. What he lacked in fundamentals, he made up for with an unusually high work rate for a heavyweight (especially one with such a jiggly physique). But this version of Arreola was 225 pounds. As his bad habits got the best of him, he gained weight and his ability to maintain pressure on his opponents, suffered. Without the stamina to run people out of the ring, Arreola resorted to fewer combinations and looking for one or two hard punches to get the job done. It didn’t work. The one quality that made him successful, outpacing his rivals, hid (to a degree) his serious defensive flaws and lack of speed. When he faced Klitschko in 2009, the likeable Areola was a sitting duck, unable to land during his busy phases and then taking a beating when he tried to rest from the outside. Things haven’t gotten much better since then. The latest arrival to the scene shares Arreola’s lack of dedication but may be even more of a more disappointment. Andy Ruiz Jr. had a very good amateur career, going 104 – 8 and representing Mexico in the Beijing Olympic qualification tournaments in 2008. Unlike Arreola, Ruiz is very quick with his hands and has the kind of fast – twitch muscle response that gives him options in the ring. He scored stoppages over fellow prospects Joe Hanks and Tor Hamer and though those aren’t contenders, it was the way Ruiz ended matters that showed his real potential. Like Arreola, there were promises to get his weight down and how he was ready to get his act together but instead of following through, the Imperial Valley native began to regress. He struggled to a 12 round decision over faded former titlist, SiarheiLiakhovich, the same guy seen making canvas angels in the highlight reel of current WBC champion Deontay Wilder. 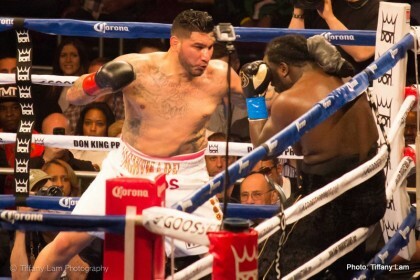 He went through the motions against Joell Godfrey, a cruiserweight and then looked terrible in winning a decision against Raphael Zumbano Love, a guy who was starched in two rounds by current IBF title holder Anthony Joshua and in ten rounds by Charles Martin who himself was just leveled by Joshua. Somewhere in this downward spiral, Ruiz was shelved by his own promoter for being overweight which sent him to Abel Sanchez in Big Bear. Then there were several last – minute withdrawals from scheduled bouts, rumored fights against Michael Grant which was about as low as one could go until 42 year – old, Ike Ibeabuchi ‘s name showed up as a potential opponent (Ike had, of course, just finished up a 16 year prison sentence). Suddenly, Andy was gone. His management has been quiet, Bob Arum has stopped talking about him anymore and even his next fight, supposedly schedule for May 14th is against TBA (Earnie Shavers?) From the looks of it, Ruiz may be done before he’s actually done anything. What a waste. A few days ago, it was reported that Roy Jones Jr. signed Mexican heavyweight, Edgar Ramirez, to his promotional company. Ramirez is a four – time Mexican national champion, a silver medalist in the Central America and Caribbean games and has competed in the World Series of Boxing. In other words, I read all the same articles about him that you did. At just twenty years old, we shouldn’t expect to see Ramirez in the thick of things for another five years, at least. By the time that rolls around, we’ll probably have a pretty good idea of whether hejust might buck the failed trend of his predecessors or continue what has thus far been, a disappointing legacy for Mexican heavyweights.